The next SSLS will be held in February or March of 2019 and will feature student roundtable discussions, a career panel and presentations by nonprofit advocacy groups. We hope to see you there! Symposium Board of Curators is soliciting proposals for schools wishing to host the following symposium. All proposals are due February 8th, 2019. View the application. What is the Sustainability Student Leaders Symposium? The annual Sustainability Student Leaders (SSL) Symposium (née Eco-Rep Symposium) brings together Student Sustainability Leaders from many different colleges and universities in the Northeast to learn and be inspired by each other during a half-day conference. Peer-to-peer sustainability education and engagement programs (sometimes called Eco-Reps) are commonly found at colleges and universities with sustainability programs. These students promote environmental stewardship by raising awareness about ecological issues and encouraging environmentally conscious behavior. A list of other names for similar programs can be found here. 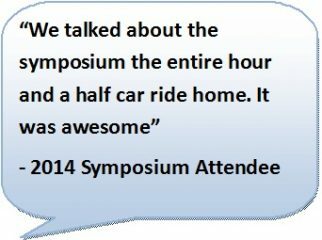 The SSL Symposium is a great opportunity for students to learn and be inspired by each other through presentations, workshops, and round-table discussions. The structure of the symposium allows students from different schools to lead sessions on a variety of topics, providing valuable presentation experience as well as facilitating the spread of ideas between schools. Sessions are typically grouped by broad topics, or tracks, such as “engagement,” “building a program,” or “communications.” The symposium typically ends with a social gathering that allows students to meet each other and share ideas informally. The symposium provides an opportunity for attendees to be part of an active community of like-minded individuals striving for positive environmental change on their campus. It also gives students the mobilizing and facilitating tools to create grassroots peer-to-peer environmental education in their communities after they graduate. After attending the symposium, students should feel empowered in their work as sustainability leaders and feel like they have been given new tools to help them overcome barriers they may face in their work. As of 2014, the Symposium is guided by a a Board of Curators made up of sustainability staff from colleges and universities in the Northeast. Its mission is to make sure the annual Student Sustainability Leaders Symposium continues to exist and flourish. It meets a few times a year to choose host schools and discuss other matters related to the symposium. 2017 – The 2017 SSL Symposium was hosted by Swarthmore College in Swarthmore, Pennsylvania. Satellite locations included Champlain College in Burlington, VT and Emerson College in Boston, MA. 2016 – The 2016 SSL Symposium was hosted by UMass Amherst in Amherst, Massachusetts. Visit the website to learn more. 2015- The newly renamed Student Sustainability Leaders Symposium was hosted by Connecticut College. 2014- The #EcoSympo was hosted at Tufts University. 2013- The symposium was hosted by Boston University and GreenerU. Check it out here. 2012- Brown University and GreenerU hosted the symposium. The schedule can be found here. 2011- Symposium was hosted by Babson College and GreenerU. 2009- Tufts hosted the first Eco-Rep Symposium and with the class Environmental Action: Shifting from Saying to Doing hosted a half-day conference for college students region-wide to share best practices in peer-to-peer education.